Since doing a Whole30, I have come to love sweet potatoes. Actually, my office has a pretty odd obsession with them. I love roasting them with other vegetables in the oven or nuking a whole one in the microwave for an easy dinner side. Recently, we had an office party and one of my coworkers brought this salad. Both Matt and I loved it so based on the ingredients, I recreated it. The fennel compliments the sweet potato and something about making it a salad lightens the whole potato thing up. Give a try and let me know what you think. Toss the sweet potato with a few tablespoons of olive oil, salt and pepper. Roast in the oven at 400 degrees for 20 minutes. Let cool to room temperature. To prepare the dressing, add 1/4 c of olive oil, mustard, garlic, lemon and salt and pepper into a mug. Whisk until combined. 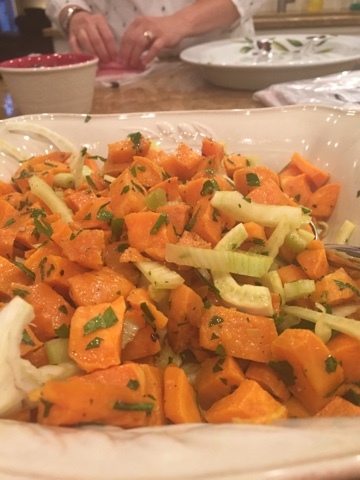 In a serving bowl, mix together sweet potatoes, fennel, parsley and green onions. Drizzle with dressing and serve.